MS The future of Plainfield swimming appears to be bright, as last night's first PCMS meet of the year resulted in not one, not two, but three broken records. In the 200 Girls Medley Relay, 7th graders Meg Parker and Grace Brackney teamed with 8th graders Julia Muskat and Sam Meier to finish in 2:02.8, beating the 1995 record established by Lindsey Coyle, Jesse Helgason, Rose Stafford and Stephanie Thompson. That record was 2:03.62, meaning this year's squad shaved .82 seconds off the record! In the Girls 100M Breaststroke, Grace recorded her second school record of the night, besting Thompson's 1995 time of 1:15.02 with 1:12.00, a full 3.02 seconds faster. In the Boys 100M Breaststroke, 7th grader Brian Beasley improved on Kyle Ellis's 1997 record when he swam it in 1:09.2, beating Ellis's mark by .28 seconds. The PCMS Swimming & Diving team returns to competition tomorrow evening, February 2, with a home meet (at PHS). Best of luck to all our Quaker swimmers and divers! 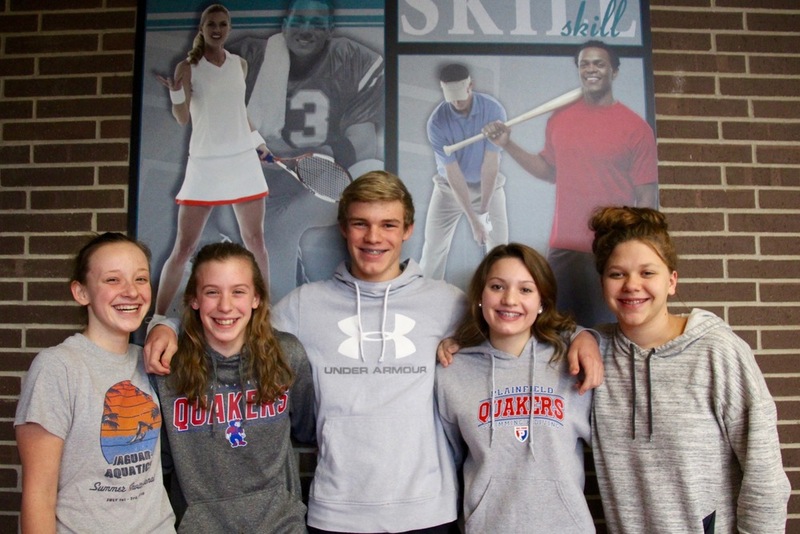 Pictured above, left to right: Meg Parker, Grace Brackney, Brian Beasley, Julia Muskat, Sam Meier.